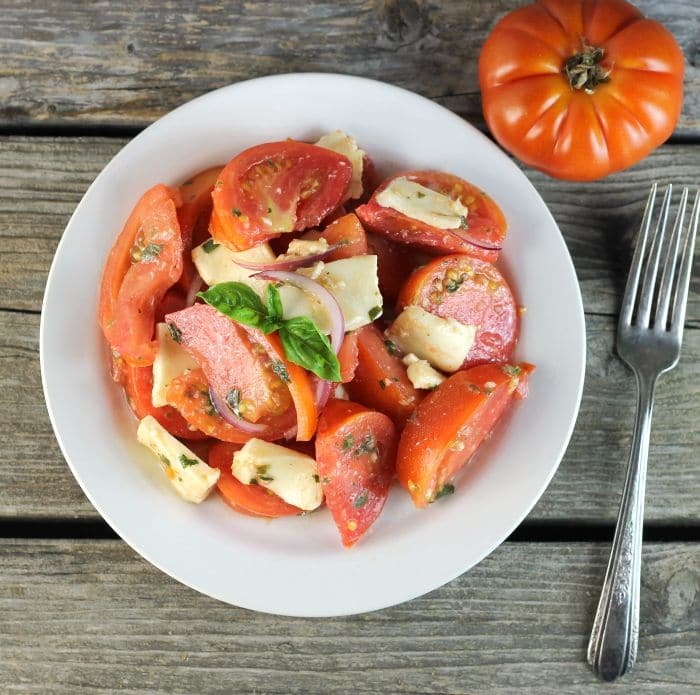 Tomato Mozzarella Salad made with tomatoes, mozzarella, and tossed with a vinaigrette dressing makes for a perfect end of the summer side dish. 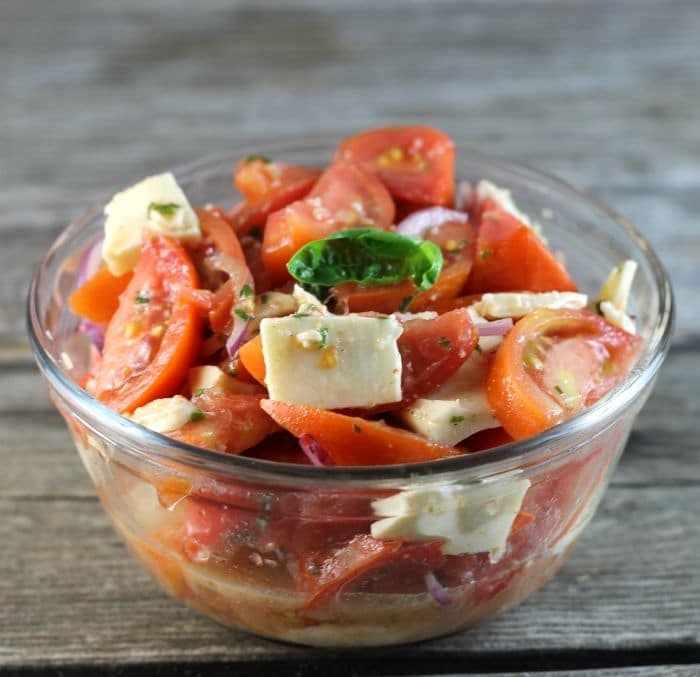 Tomato mozzarella salad is a great way to use up some of the tomatoes that may still be left in your garden. I tossed this salad with a fresh basil and oregano vinaigrette dressing. It comes together and makes for a great tasting salad. We always plant a lot of tomatoes in our garden each year. They are great for eating fresh, but we also love to can spaghetti sauce and salsa for when the snow starts to fly. The spaghetti sauce is not only great for making spaghetti with, but it also doubles as a great pizza sauce. Well at this time of the season I am happy to say that we are done with the canning for the season and the canning equipment is tucked away for another year. But now comes the question what to do with the rest of the tomatoes that are still lingering in the garden. That is where the tomato mozzarella salad comes into play. I have to admit that I love to eat tomatoes as a side as they are and I love them in a BLT but sometimes it is fun to try something new. Mozzarella cheese is always a good thing when it comes to tomatoes. It’s kind of like peanut butter and jelly or peanut butter and chocolate things that are perfect together. Then when you add fresh herbs as the basil and oregano with the olive oil, red wine vinegar, and garlic you truly have something that you will fall in love with. It is so simple to make and you can make it ahead of time so that the flavors have time to blend together. Or if you can’t wait you can eat it right away. 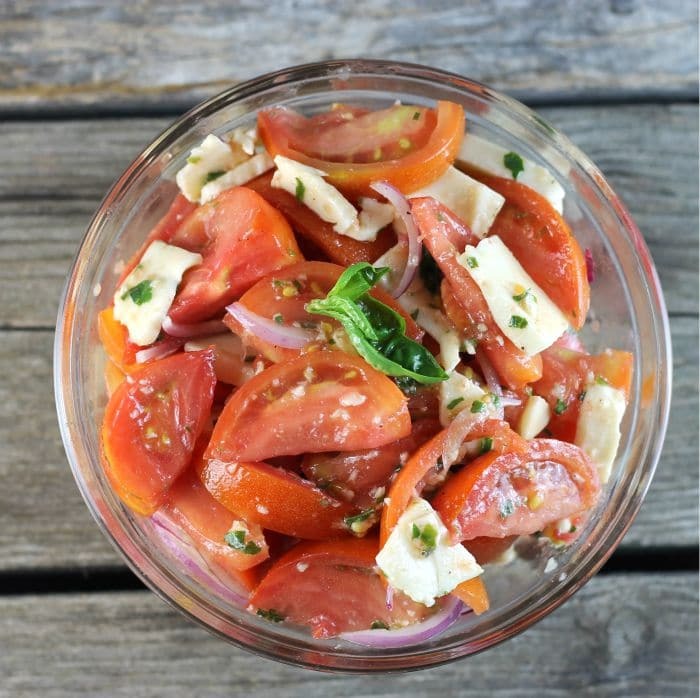 If you have tomatoes that are waiting to be used try this tomato mozzarella salad. Wash and dry the tomatoes. Cut the tops out of the tomatoes. Cut each tomato into wedges. Slice the mozzarella cheese and cut into desired sizes. Slice the onion. 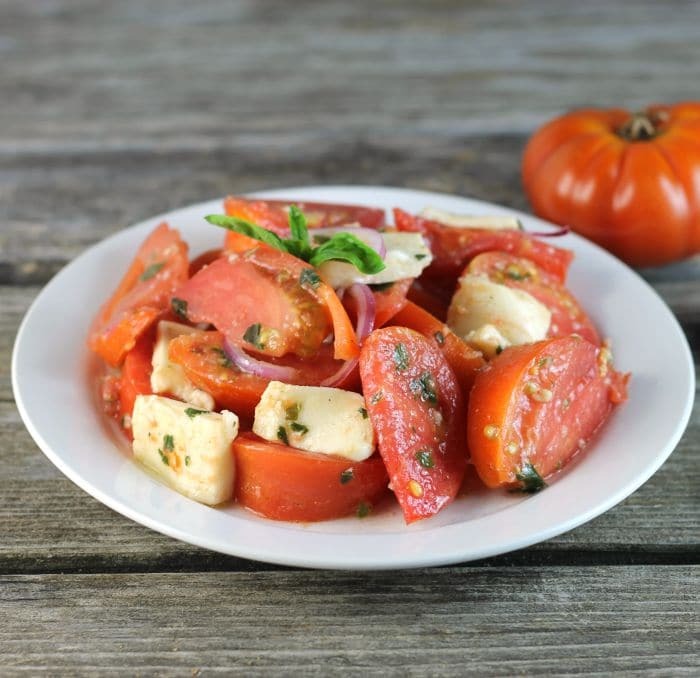 Place the tomato wedges, mozzarella, and onions into a large bowl. Add the garlic, fresh basil, and oregano into a mini food processor. Process until the ingredients are chopped. Add the olive oil and red wine vinegar and process until the garlic, basil, and oregano are blended with the olive oil and red wine vinegar. Pour the dressing over the tomato mixture and toss until the tomatoes are well coated. Season with salt and pepper to taste. Can be eaten right away, but it is best to refrigerate for an hour or two before serving. A simple and delicious salad! This is perfect for all my garden tomatoes! Like a pizza in salad form! Guess what I have packed for lunch today? Yup, a tomato and mozzarella salad! Great minds must think alike, right, Dawn? 😉 I’ll have to try your delicious vinaigrette though!